This is a project of the Environmental knowledges research theme. Whereas the importance of the world oceans for global security - particularly their circulation, oil and gas reserves, fishing stocks and indigenous culture - is now widely recognised, they are all threatened or endangered. However our knowledge of their environmental history, how they came to be the way they are, is surprisingly limited and at best fragmented. Dr. Bravo's research aims to develop the historical foundations for a new interdisciplinary understanding of the science of the oceans that can explain the nature and direction of change, and take account of the much greater and more diverse communities of historical actors or stakeholders than has been widely acknowledged. Today we tend to think of the maritime world as opaque, sparsely populated, fragile, exotic spaces that fill the zones between the globe's continents. Of course these are by no means our only impressions, but how did this way of imagining the oceans come to be, and what are its implications for conserving what remains of the life forms within them? Looking to the past, we first need to recognise the ubiquity of maritime or fluvial metaphors in the economic and cultural life of many societies, certainly this was true in Britain. In the eighteenth century, the English geographer James Rennell, and many contemporaries, thought of canals, rivers, and oceans as a network of routes, each more or less navigable and economically valuable according to its situation and physical character (see Bravo 1998). The vision of a global maritime network became 'naturalised', that is a set of facts, through the development and application of techniques of science and engineering starting in the enlightenment. As new canals and riverways were designed and dug, mathematical and engineering techniques were developed that would soon be applied to navigation on the oceans. Commercially-minded innovators set their minds to improving their knowledge of the maritime natural world so as to harness it more efficiently and safely. In 'Geographies of Exploration and Improvement', Bravo (2006) argues that the phenomenon of improvement was no less important in transforming the maritime world of the Arctic than the agrarian landscape about which much more has been written. A capital-intensive whaling industry (1780-1820) quickly decimated the population of Bowhead whales in the Greenland Seas, while simultaneously whalers acquired an unprecedented level of scientific expertise about the natural history of the oceans. The technological and economic power to destroy the oceans also brought about the means of understanding them. The maritime realities of non-European cultures required Europeans to adapt their agrarian ideals. The attempts of missionaries, who were in many regions the vanguard of European colonisation, to impose agrarian improvement on the Inuit of Greenland, illustrate this point clearly. In 'Mission Gardens: Natural History and Global Expansion', Bravo shows that when the Moravian missionaries arrived in Greenland in 1733, they were forced to adapt their agrarian way of life to the dominant local fishing economy, while still attributing symbolic value to tending gardens at their settlements. Dr. Bravo documented the contrasting ways that the sciences served colonial improvement in two Arctic countries. Sweden embarked on Arctic expeditions to survey the lands and seas using a panoply of precision instruments; whereas Denmark used the sciences as instruments for administering their relationship with Greenland, building on a tradition of christianisation to demonstrate Greenlandic consent to, and appreciation for, colonisation. 2008 'Sea Ice Mapping: Ontology, Mechanics, and Human Rights at the Ice Floe Edge', D. Cosgrove and V. della Dora (eds.) High Places: Cultural Geographies of Mountains and Ice. London: IB Tauris. (in press, Autumn 2008). 2007 'Mission Gardens: Natural history and Global Expansion, 1720-1820'. In L. Schiebinger and C. Swan (eds. ), Colonial Botany: Science, Commerce, and Politics, 2nd ed., University of Pennsylvania Press, 49-65. 2005 'Reinventing Natural History', Invited contribution to forum discussion of H. Raffles, In Amazonia (Princeton U.P., 2002), Antipode 37(2): 369-373. 2002 M. Bravo and S. Sörlin (eds. ), Narrating the Arctic: A Cultural History of Nordic Scientific Practices, Nantucket Mass: Science History Publications. 2002 'Measuring Danes and Eskimos', in Narrating the Arctic: A Cultural History of Nordic Scientific Practices Nantucket Mass, Science History Publications, 235-273. 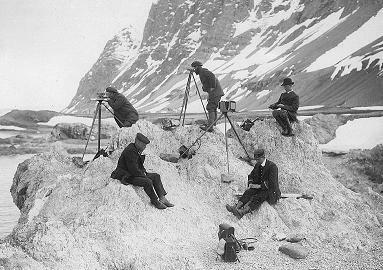 2002 M. Bravo and S. Sörlin, 'Narrative and Practice', in Narrating the Arctic: A Cultural History of Nordic Scientific Practices Nantucket Mass, Science History Publications, 3-35. 2002 'The Geography of an Empire Licensed by Providence', Essay Review of Nature's Government: Science, Imperial Britain, and the 'Improvement' of the World. New Haven: Yale University Press, 2000, Annals of Science 59(4): 413-418. 1999 Ethnographic Navigation and Enlightenment Geography, in Enlightenment and Geography. D. Livingstone and C. Withers (eds. ), Chicago: University of Chicago Press, 199-235. 1998 'Precision and Curiosity in Scientific Travel: James Rennell and the Orientalist Geography of the New Imperial Age (1760-1830), in Voyages and Visions: Towards a Cultural History of Travel. J. Elsner & J. P. Rubiés (eds. ), London: Reaktion Books, 162-183.